Many of the men and women doing today's most consequential environmental work-restoring America's grasslands, wildlife, soil, rivers, wetlands, and oceans-would not call themselves environmentalists: they would be too uneasy with the connotations of that word. What drives them is their deep love of the land-the iconic terrain where explorers and cowboys, pioneers and riverboat captains forged the American identity. They feel a moral responsibility to preserve this heritage and natural wealth. Unfolding as a journey down the Mississippi River, Rancher, Farmer, Fisherman tells the stories of five representatives of this stewardship movement: a Montana rancher, a Kansas farmer, a Mississippi riverman, a Louisiana shrimper, and a Gulf fisherman. 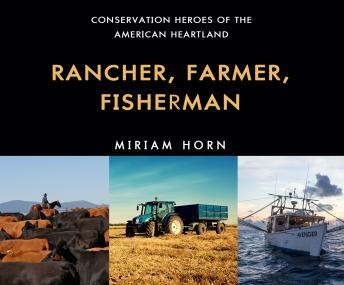 In exploring the essential geographies they protect as well as their work and family histories, Rancher, Farmer, Fisherman challenges pervasive and powerful myths about both American and environmental values.